Tell Dad how much you love him in your own words with this personalized gift that provides plenty of room for your own customized message. 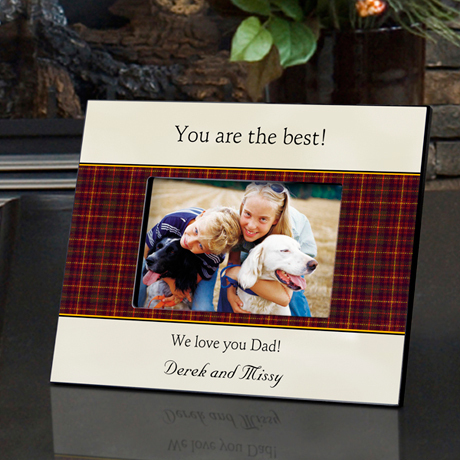 Perfect for Father's Day, birthday, or any occasional when you just want to say "I Love You", this picture frame is decorated with a subtle plaid and parchment background and matches even the most masculine decor. Frame measures 8" x 10" and holds a 4" x 6" picture. The top text line accommodates up to 35 characters while the bottom two text lines feature up to 25 characters. Allow 2-3 weeks for delivery. Item can only be shipped within the Continental US.